About Face is not your average run of the mill piece of work from David Gilmour, but that was the intended purpose, as he said when he released it. The idea was to get together with some of the most talented friends, and it was quite a large group of a who's who variety. Placed evenly behind Gilmour is a solid backing band in Pino Palladino on bass, along with Ian Kewley on Hammond organ and piano, and Jeff Porcaro on drums, there is a long list of guests. Teaming up with Bob Ezrin playing, producing and arranging, Gilmour invited everyone from Jon Lord and Roy Harper, to Steve Winwood and both Vickie and Sam Brown, to name just a few. There is a lot of eighties style experimentation going on, not that different in some of its opposition to Pink Floyd than what Roger Waters did on his solo work around the same time. Although this is much different than that, both did accomplish something not of the norm, so to speak. This rattled fans of Pink Floyd, but at the same time satisfied plenty as well. The album still elicits the same reaction now as it did then. One could list every musician per song to help explain the super eclectic vibe of the disc but it isn't as important as the outcome of the tracks, as they're all very well blended and constituted for such a mixed bunch of players adding their artistic contributions. This is an excellent disc that has always flown beneath the radar since it was released. One must remember this was mid-decade and most veterans of the heavier rock scene were doing all they could to make currently inclined music in a changing landscape, some even going to great lengths to try and fit in, but Gilmour and his recruits proverbially marched through it with the best of them. At the time these were very modern progressive rock cuts. They have gone on to mature quite gracefully. It suffers from being rendered primarily an eighties drenched release, but the eighties didn't often produce the quality of material found here. So this remains a throwback sleeper in its own right. 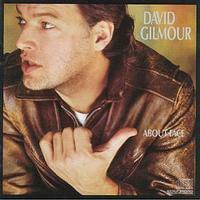 Opening things right away with a funky keyboard intro that maintains throughout with a matching percussive pace, Gilmour's ever familiar vocal carries a soothing melody across the ebbing back beat like an eagle soaring gently above water. The guitar parts flow in and out with ease as he equally provides his vocal and string talents with beautiful runs and fills into a groovy solo and then rides it out to the end with more of those tremendously relaxing melodic touches for which he is well known. This tends to sound like some of his later work with Floyd but it proved to be a seed well worth planting, as this is a great way to establish the vibe of the whole disc with a superb start. This begins with a sweet acoustic guitar and quickly the vocals come in with a melancholy approach before an interesting bass solo, and then, pow! Gilmour lets out a huge cry and goes off the scale with an emotional singing performance that sends a chill up the spine before some more interesting and well arranged instrumental work dazzles the ears as it fades away. This is simply cosmic in its delivery. It really is all about Gilmour, even though he is backed by such greatness it somehow commands everyone to do an About Face in his honor. One of the musicians to not go without mention here is Pete Townsend who wrote the lyrics to this beautiful number, and there is also actually quite a Townsend vibe to a few tracks to these ears. This is a great ballad. I love it as the organ adds a touch to the whole softness of it at the end, it's a totally astonishing piece of work, but it could use another minute or too to savor the beauty of it all, otherwise this is absolute perfection. This takes a bold, but somewhat surprising, turn in the groove of things, and the eighties are probably most felt inside this track than the rest, with a daring club kind of vibe. There was a video clip and it was released as a 12" maxi single to help it chart along with a few others from the disc. This track isn't that bad, but the majority of Floyd fans hailed it among Gilmour's worst solo tracks. Featured on Hammond organ on this one is Steve Winwood, but I have often wondered how it would've sounded if Jon Lord chucked the synthesizer and added a second Hammond to beef it up. Then it would contain the bite that is perhaps missing to all the fans and it might rate much differently. I can understand the frustration, but maybe the humor didn't shine through here as much as Gilmour obviously intended, although he attempted to come off seriously as well. I think it resulted in not having it both ways for all involved, including the overall reaction to it. In retrospect, it dates better than expected, and is often pointed out to highlight the sounds on About Face. It just wasn't the best idea in the bunch, so it was a commercial intrusion of sorts and marks the only flaw here in my opinion, if there is one. One thing I do really like is the catchy riff. This is another light-hearted tune throughout, and it's well worth getting back to at this point with everything one expects from Gilmour. It' is a favorite concerning the straight forward ballads here as he shines like only Gilmour can. One can't help but be moved by the arrangement and that unmistakable voice along with some more mildly interesting instrumentation for good measure. It's mostly his show here, as usual. In the final outcome he clearly commands the musicianship by the end of another lovely track. More lyrics from Townsend are featured on this short but sweet cut with Gilmour coming on strong again to pick things back up a bit. This is almost in the same vein as “Blue Light,” but it's a lot catchier and serves as an improvement in the process. The eighties factor has a less menacing effect here as the vocals cut through with a much more passionate and honest performance. This track has a different vocal key, a very soft touch as he does his best falsetto approach I can ever recall. It works, for the most part, and stands out better than the tune itself which is rather all over the place and almost detracts from what is an otherwise fantastic performance. This doesn't come without some excellent guitar work that saves the arrangement from being too sappy. All in all, this is another featured gem. The female backing vocals are provided by the mother and daughter duo of Vickie and Sam Brown which adds a spicy taste in just the right places. Sam Brown, of course, worked with the Pink Floyd before, and Jon Lord and even later Deep Purple as well. This sounds close to the work Waters was doing on Pros and Cons of Hitchhiking. This has an eighties digital sound that now has a good vintage effect. It also features a nice guitar and organ swirling about with notes that perfectly spar together. A calypso vibe carries this little tune out with a light and cool breezy arrangement. It takes some warming up to, but it gets through if you let it. Once again, Gilmour saves an otherwise not so instrumentally dominant track with his signature voice that cuts through the almost techno sound and island music approach by way of a clever abstract delivery. This is an awesome instrumental which contains some brilliant guitar work that is marvelously backed by a fine orchestral arrangement provided by Michael Kamen. There are no words because words simply can't define the combustion of the music. It's both elegant and brash at the same time, a perfect union of sound and space colliding with the utmost class. What a magnificent piece this truly is. I could use twice the relatively short running time here again, as it's easily worth some extended enjoyment. This is a track that captures its title without lyrics so well that it's absolute magic. Things close with the longest track (only slightly) on the disc. This is a mellow number with amazing acoustic and electric work from the modest master of the proceedings himself as he ends on a soft as silk note. It’s a perfect way to end ten such well arranged pieces of at times both uplifting and intense, yet mellow and moody progressive rock.